Sulu gay? Next thing you'll be telling me is that there are lesbians in the WNBA! His five-year mission: To explore strange new discos; To seek out new life in fabulous new hair salons; To bold go where Elton John has gone before! Jim, I'm a doctor not a Fire-Island aficionado. Beam me up, Scotty. There's no club life here. Captain, I'm not getting anything on the scanners. Perhaps Sulu could use his gaydar? "Damn it, Jim, I'm an old country doctor, not a gender counselor!" Remember Mr. Sulu's greatest episode on the original series? Most of the time he just drove the ship. 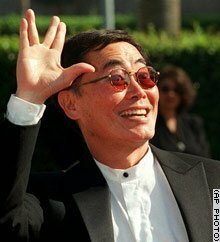 But in the episode where everyone lost their inhibitions due to some disease or lame glowing special effect (I can't remember) what did Sulu do? He took off his shirt and ran around the ship with sword.